A former Republican gubernatorial candidate sent a cease-and-desist letter Wednesday to Gov. Dannel P. Malloy, threatening legal action should his lame-duck administration try to close on the purchase of land for a controversial State Police firing range at Pachaug State Forest in Griswold. 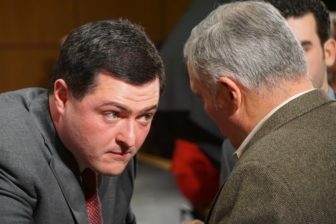 Timothy M. Herbst, a lawyer who campaigned against the project as a candidate and now represents several owners of property near the 113-acre site and the group, Save Pachaug Forest, said he suspects that Malloy will make a move towards construction before leaving office on Jan. 9. Herbst said he will seek an injunction should Malloy take any step toward completing the purchase. Republican Bob Stefanowski and Democrat Ned Lamont each have publicly expressed opposition to placing the firing range in Griswold, a rural community on the Rhode Island border. Officials chose the site, saying it would be bordered on three sides from forests that offer a sound buffer. A Malloy spokeswoman defended the project, while deferring comment on Herbst’s threat. Opponents said the range is not centrally located and represents an expense the state cannot afford. State Police currently use a firing range at the base of Avon Mountain in Simsbury near the Farmington River. Police said the 12.5-acre site is too small and frequently floods.